What happens when the tidy, prosperous life of an urban couple is turned inside out by a tragedy with unexpected consequences? After a car crash leaves their friend Marcus dead and his wife Sarah in a coma, Ana and James are shocked to discover that they have become the legal guardians of a 2½-year-old, Finn. Finn's crash-landing in their lives throws into high relief deeply rooted, and sometimes long-hidden, truths about themselves, both individually and as a couple. Several chaotic, poignant, and life-changing weeks as a most unusual family give rise to an often unasked question: Can everyone be a parent? 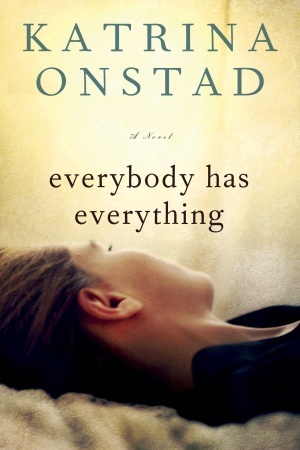 Everybody has Everything has some poignant thoughts on life, love and marriage, but I found myself unable to connect to the two main characters. I could however relate to their relationship struggles which I found the most fascinating aspect of this novel and many of the relationship observations were bang on or made me sit back and think for a few moments before continuing. Both main characters, Ana and James are deeply flawed, which made them interesting enough to read about, but I found them both really self-absorbed as well as not at all warm and loveable and I worried constantly about a child being handed over to their care. I found myself most drawn to their relationship, interested in each character’s role in its demise and often wondered if it would survive the disruption of Finn’s arrival. I also really enjoyed the exploration of Ana’s fear of motherhood and her ambivalence toward children, which was different from many novels where women are portrayed as baby crazy. It was also interesting to watch James’s ambivalence towards his marriage. There was one stressful, heart breaking scene that really got me and lead to some rapid flipping of pages, but other than that, I bobbed along, not as invested as I hoped to be. The ending didn’t sit well with me at all. I wanted things more clear, when there were left cloudy and ambivalent. There were also point of view changes that really threw me, and I had to re-read several passages over again to confirm who was speaking and how we went from one person to another, which I found detracted from the story. Another plus to Everybody has Everything is I that love reading novels where the setting is in my home town of Toronto, and I know exactly where the characters are walking around and the landmark references so I don’t have to gloss over the details. I thought this one was skillfully done in that you would never really know where you were unless you lived there. And in no way does this setting detract if you didn’t. It comes across as any city, with a few Torontoisms and neighbourhoods thrown in. Overall, I enjoyed Everybody has Everything enough, but found myself unable to completely agree with the rave reviews out there, and there are plenty of them to be found. I would definitely read another by Katrina Onstad though!